It’s Time; you may remember a few months ago I said I was going to change how the world sees Godzilla. Well, this is where it starts, my first review of a Godzilla film and it is one of the Best, Godzilla vs King Ghidorah. Godzilla vs King Ghidorah is one of the biggest monster fights ever. The film’s title says it all, the fight Godzilla fans have been waiting for. Godzilla vs King Ghidorah, One on One. These 2 have had a big History; King Ghidorah is Godzilla’s most powerful enemy. A Golden Dragon with 3 heads and breathes Lightning (in the same way that a Dragon breathes Fire except that it is not fire it’s Lightning). Godzilla is a nuclear giant monster with the Atomic Death Ray. In the course of all 29 Godzilla Films these 2 have met 7 times (7 Films) and only once in a one on one fight, mainly because one of the 2 monsters usually has assistance. This is the 18th film in the series and the 5th time the 2 monsters have met. Godzilla vs King Ghidorah has one really good story and some really good effects. The film was made after Godzilla vs Biollante. When the film did not do very well, Godzilla Creator Tomoyuki Tanaka decided to make a film that would include Godzilla’s Greatest Nemesis – King Ghidorah. One Interesting point is that Godzilla gets talked about a lot but does not make an appearance for a long time. An interesting origins story is put in place which is different from the original origins story. In this new version of the origins story Godzilla appears but in a different form and it is this part of the story helps pave the way for the Big Villain – King Ghidorah. The film begins with a submarine searching the depths of the sea and finds the body of a 2 headed Giant Dragon. One of the passengers is amazed and even more so when he finds out it had 3. It lost the other head when it fought Godzilla in the 20th Century. A UFO is then sighted above Tokyo; everyone sees it, except for a Writer named Terasawa who wakes up in the morning. The story is in the newspaper along with another story about a man who claims to have seen a real life dinosaur. The man claims that while stationed on the isle of Lagos the dinosaur defended the Japanese troops who were being attacked by the Americans during World War 2. Terasawa then does some research and then begins to think that the dinosaur turned into Godzilla. When on a routine patrol 2 army helicopters find the UFO and then blow up in mysterious circumstances, when a group of soldiers investigate they find the UFO. Terasawa then talks to a business man called Shindo who was on Lagos. Shindo does not want to talk to Terasawa but changes his mind when Terasawa tells him that it might have turned into Godzilla. Shindo gives photos to Terasawa who then shows it to Professor Mazaki who sees some resemblance between the Dinosaur and Godzilla. The army then begins to surround the UFO with Tanks. 3 People (holograms, pretty good special effects for the 1990’s) come out of the UFO and ask to have a meeting with the Japanese Prime Minister. The 3 people are time travellers and the UFO is a time machine. The 3 people have come from the future to warn japan of a terrible threat. Due to a set of chain reactions starting with Godzilla, there is no longer a Japan. Terasawa, Professor Mazaki and Miki Saegusa (a lady with telepathy) are asked to go to the Prime Minister’s Office. Terasawa is shown a book that was written by him in the future. The time travellers want to go back in time and remove the Dinosaur from the island before it gets blasted with the H Bomb that was tested on Lagos. This is what turned the Dinosaur into Godzilla. They also ask that Terasawa, Mazaki and Saegusa travel with them. They travel back in time with one of the 3 Time Travellers Emmy Kano and android M11 in a smaller craft back to the day of the dinosaur in a smaller time machine. They arrive on the Island of Lagos. A small group of Japanese soldiers start to get slaughtered by the American platoon. Until a dinosaur suddenly appears and attacks the Americans. The dinosaur gets wounded by American ships but destroys the American force on the island. A few days later the Japanese thank the dinosaur for saving their lives before leaving. The time traveller’s then teleport the dinosaur away from Lagos. Before returning to the future Emmy leaves 3 little golden creatures on the island. When the group returns to the future they find out that a new monster has arrived, King Ghidorah. The time travellers then use King Ghidorah to destroy Japan. Emmy fells sympathetic for her homeland and tells the truth. In the future Japan becomes an Extremely Powerful Country. Shindo and the Government come up with a plan to make a New Godzilla using a Nuclear Submarine. Terasawa discovers that a nuclear submarine sank where the dinosaur was placed. Terasawa and Emmy travel to talk to Shindo but M11 stops them reaching him and takes Emmy back to the ship. Emmy later re programmes M11. In the sea, the nuclear submarine sent by Shindo gets destroyed by Godzilla. Professor Mazaki and Miki travel to the area the submarine was destroyed and see Godzilla rising out of the sea. Terasawa, M11 and Emmy decide to sabotage the UFO. Jet Fighters are sent out to attack King Ghidorah but are no match for it, then Godzilla Arrives. The time travellers end King Ghidorah to fight Godzilla. As Godzilla fights King Ghidorah, Emmy, Terasawa and M11 sabotage the computer controlling King Ghidorah. Godzilla is still fighting King Ghidorah and in the process King Ghidorah loses its middle head. Emmy, Terasawa and M11 use a smaller Time Machine (the same one they used when they went to World War 2) and use its Teleportation device to teleport the UFO to where Godzilla is, Godzilla then destroys the UFO. King Ghidorah begins to fly away, Godzilla then blasts King Ghidorah sending King Ghidorah into the sea. Godzilla then goes to destroy Sapporo. The army do their best to stop him, but are unable to do so. I will return to the story in a minute. It is important to point out that Military Weapons have no effect on Godzilla. 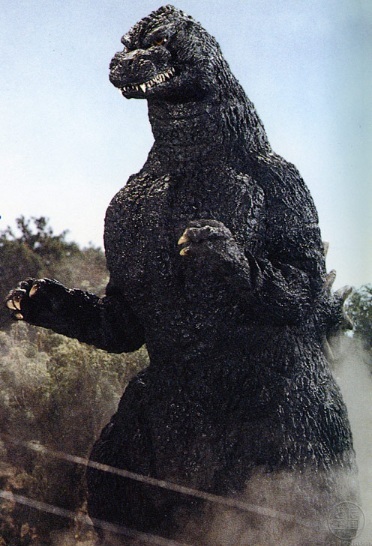 You may be thinking “yes they do – 1998 American Film”, Well that was not Godzilla, That was Zilla; Zilla is a lot smaller than Godzilla and has NO Atomic Breath. In the 28 Japanese Godzilla Films; Tanks, Planes, Missiles, Helicopters, Ships, Laser Weapons, Laser Tanks and many more things attack Godzilla and Godzilla does not feel a thing. Godzilla wins against the military every time. The only time something Man Made killed Godzilla was in the original 1954 Godzilla King of the Monsters. But I will explain that later. Now Back to the Story. Thinking they can’t stop Godzilla with Military Weapons the group think that King Ghidorah might be able to help them. Emmy and M11 go forward in time to repair King Ghidorah. Godzilla attack’s Tokyo, during the attack Shindo stays inside his company Head Quarters when Godzilla walks past. For a moment Godzilla seems to recognise Shindo from their encounter during World War 2. Godzilla then destroys the Building with Shindo inside. Then King Ghidorah returns with new Cybernetic Parts and a robotic Middle Head. Godzilla and Mecha-King Ghidorah fight each other in a tense battle ending with Mecha-King Ghidorah flying away with Godzilla before landing in the sea. Emmy (who was controlling Mecha-King Ghidorah from inside it) manages to escape says farewell and travels back to the future. At the bottom of the sea, Godzilla wakes up from the crash, a sign that no matter what you do – You cannot beat The King of the Monsters. Godzilla vs King Ghidorah is one of the best in the series. The film has a very good sound track provided by Akira Ifukube who provided music for many Godzilla films between the Original in 1954 to Godzilla vs Destroyah in 1995. The film has a good range of characters some of which continued to appear during the Heisei Series. One thing I recently discovered is that Katsuhiko Sasaki who plays Professor Mazaki has played roles in Godzilla films in the past, he appeared in both Godzilla vs Megalon and Terror of Mecha-Godzilla. The character of Shindo is interesting, played by Yoshio Tsuchiya; Shindo acts like someone who thinks Godzilla is his friend, especially for a minute when Godzilla recognises him, then destroys the tower Shindo is in, Tsuchiya plays the role well. One interesting character is a girl who works with Terasawa. She is a very mysterious character; I don’t think her name is mentioned once in the whole film. She plays the role of Terasawa’s Girl Friend and for most of the middle bits she is not seen, although she does appear at the end with Terasawa. However the best character (human wise, the Monsters are always the main stars) is Fujio played by Tokuma Nishioka. A strong character even in times when cities are being destroyed. It’s sad that this is the only time the character appears in the series. Let’s not forget who the main stars are. We Have Godzilla and King Ghidorah. The 2 roles were played by Hurricane Ryu (King Ghidorah) and Kenpachiro Satsuma (Godzilla) with Wataru Fukuda (The Dinosaur). The 2 main roles were played in suits, this is better than CGI because it looks more realistic – it does. This also makes the fight scenes look good because you have 2 people in suits fighting each other. Kenpachiro Satsuma said in a BBC Documentary that he brought some of his Martial Arts into the role and before filming he would get into the part by saying to himself “I am Godzilla”. One interesting point about the film is the audience reaction in Japan. In a BBC Documentary from 1998 (this might have happened since, I don’t know) it was revealed that when the Tokyo Metropolitan Government Building was demolished by Mecha-King Ghidorah it was the only time a Japanese audience has cheered when a building is being destroyed. I could go on talking about this film for a while, but I want to save some parts of the film for a more General Godzilla Look. Godzilla vs King Ghidorah is very enjoyable with a Good Story. It is not my favourite from the Series – That is Godzilla, Mothra and King Ghidorah: Giant Monsters All-Out Attack. However Godzilla vs King Ghidorah is one of my absolute favourites and one of my top Favourites from the Heisei Series. Plus it has the fight we have always wanted. Godzilla vs King Ghidorah – 1 on 1. If you like Monster Movies, you are going to love this; Watch It.